Tikal the Echidna - Concept: "Mobius"
Art by SEGA. Graphic by DarkFailure. (1). 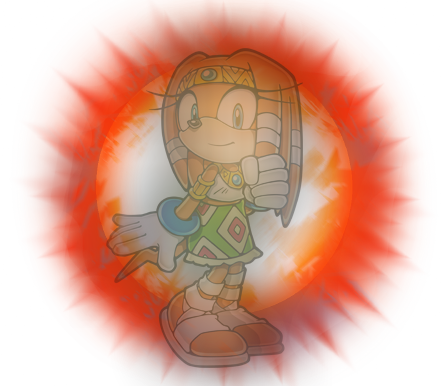 Tikal may be deceased, but her conjunction with the Master Emerald has granted her the gift be able to take the form of a mysterious ball of light/spirit orb and even spiritually assume her physical form if need be. (2). Has the ability to temporarily warp people back in time and even allow them to interact with their surroundings completely in the past. (1). Tikal is the only other known character that has been able to utilize and access the powers of the Master Emerald, and so far is the only known character that could communicate with and understand Chaos. (1). Seems to be rather frail and petite; God knows that if a bunch of echidnas were to trample Sonic or Knuckles, they wouldn't have thrown in the towel so quickly. (2). Although she can present herself to others, she is limited to spiritual form mostly in the shape of a glowing orb of light. - Wears a large golden necklace with an unknown jewel in the center, matching her headband and triangular markings in the necklaces' segments. - White bandages around many of her quills and on her lower left arm. It's unknown for absolute certain if they are bandages, they may be fur markings/body paint alike to that seen on the male echidna warriors of her clan. We may never know for sure. Even though Tikal may have been brought up in a rather inhospitable world, tainted in conflict, greed and political stand-off, she always managed to be a kindhearted pacifist. Tikal's morals are based primarily off of those of her grandmother's, who possessed a conduct comparable to that of her granddaughter. Short as it was, Tikal’s life wasn’t always filled with strife, despite her clan being embroiled by war for most of it. Most of her days were spent with her grandmother, and her father, when he had time for her. But, she was just as content to play by herself, often contemplating her grandmother’s teachings. One day, she found herself playing nearby a certain shrine, where she found the often talked about creatures known as Chao! While her presence frightened the little critters at first, they warmed up to her gentle spirit quickly. It was this display of warmth that also garnered the attention of the Chao’s guardian, who revealed himself to the young echidna. The gems had to be the seven Chaos! And the large gem in the center of the shrine, it HAD to be their controller!! Tikal’s mind, safe to say, was blown by the revelation. But, she had little to no time to take it all in. The Knuckles clan was losing the war against their enemies, and they needed an edge. Pachacamac had a plan, but it was not a wise one: To use the gems - particularly the large Emerald – and crush the opposition once and for all. Tikal was appalled at the idea of perverting the Chao’s home for the sake of war. To her, the war her people were participating in was pointless enough; attacking other countries, stealing and killing…none of that could possibly be the right path to peace! But, no matter how much she begged her father not to take the holy grounds of her friends, Pachacamac would not hear it. Talking to her friend, the water spirit, didn’t help, either. She warned him about her father’s plans and beseeched him to move everyone away from the shrine ASAP, but he could not leave, nor could the Chao. Eventually, things came to a head. Pachacamac took a few of his best warriors to the shrine to take the Emerald by force. His daughter and the Chao stood in his way and, true to her Echidna blood, would not budge. Though her father insisted that the power he was after was for the people – her people – and that it was necessary, she knew better. The Emerald’s power would not be enough for them, and that they’d always want more. Sadly, her pleas fell on deaf ears, as the chief was sick of attempting to barter with a child and ordered his men to storm the shrine. When Tikal came to, she found that she had awoken to a nightmare. The Chao were dead, the corpses of her family lay strewn about and the benevolent water spirit she had come to know had used the power of the seven Chaos to become an angry, rampaging monster, unleashing his wrath upon the clan that had harmed his brethren…and hh was just getting started. Battered and broken, but refusing to give up, Tikal limped over to the Emerald, finally realizing the meaning behind the mantra she was taught. If the gems could turn thoughts into power, and the Emerald before her controlled it all, then she could use it to stop Chaos! With her final breath, she imparted her will upon the stone, canceling out the gems in the creature’s possession and imprisoning them both with the Master Emerald, as it would come to be known. Two millennia later, both Tikal and the monster – now known as Chaos – would be released from the Master Emerald by the mad scientist, Dr. Robotnik, who was looking to use Chaos to his own nefarious ends. Tikal sensed this and wanted desperately to keep history from repeating itself, but as a spirit, there was very little she herself could do. So, she had no choice but to assist those who could stand against the Eggman in her place. Along the way, she attempted to share her past and warn the heroes of the coming threat. But, to no avail. Chaos soon got every Chaos Emerald, kicking Eggman to the curb and decimating Station Square, picking up right where he left off 2,000 years ago. As Sonic saw the destruction around him, Tikal finally made her ethereal presence fully known. Her heart and soul had resided with Chaos in the Master Emerald for all these years. She had been forced to endure the anger, hatred and sadness that had built up inside him. Something had to be done before he truly destroyed the world beyond recovery. For the solution, check with Chaos’ bio, but after the proverbial dust settled, Chaos was back to normal, and Tikal happily introduced him to the Chao of the present, who had been able to survive and live in peace with humans and Mobians. The fighting was over and harmony had been restored. It was finally time for Tikal to rest. With a thank you to Sonic and the others, she returned Chaos to the Master Emerald…while Tikal herself departed to the afterlife. Greatest Friend(s): The Chao that inhabited the Master Emerald shrine, and Chaos: the mysterious water spirit/mutated Chao that protects the Chao. Other Friend(s): Sonic the Hedgehog, Miles “Tails” Prower, E-102 Gamma, Amy Rose and Big the Cat. Likes: Peace and harmony among all, the Chao at the Master Emerald shrine, and being able to spend time there with them. Dislikes: War, greed, and any meaningless immoral intentions. Favorite Music Genre(s): Possibly New Age. Occupation: Unemployed (obviously; the dead can’t work). Place of Residence: When she was alive, she probably resided somewhere near the large temple seen in the Mystic Ruins. Now her soul has departed to the afterlife. Original Purpose: Supporting role in Sonic Adventure. Current Purpose: Hasn't changed; she no longer appears as a key character in the storylines of the Sonic games. Nowadays, her appearances are more nonconsequential. Date of first promotion/presence in the industry: Tikal's debut in the industry came along with the release of the Dreamcast title, Sonic Adventure, released first in Japan on December 23rd of 1998. Impact on Series: Tikal’s inspiration is interesting trivia and she’s served her purpose. That being said, she seems to still be favored with Sonic Team, as she’s made something of a comeback within Sonic Channel and Sonic Runners. Good to see, honestly. Original Designer: Unconfirmed. Yuji Uekawa or Takashi Iizuka? Design Process: Unconfirmed. Tikal's design process was probably similar to how all of the others were made. Many design sketches were made, and Tikal's final design was chosen. Simple as that. Possible design inspirations: Tikal has design inspiration written all over her. Sonic Adventure's storyline and environment were both inspired by a trip Sonic Team took over to Central America. Tikal's name, for starters, is after the city of Tikal located in Guatemala. Although it is mostly ruins now, it was one of the most prestigious ancient cities in Mayan culture. Her father's name, Pachachamac, is named after a mythological deity of the culture who has the power of earthquakes and fire. Even her appearance is based off of the tribal attire. For a long time, I felt sorry for this girl. She was made for literally one game and had little to no chance of showing up again without it being ridiculous. This was a shame because she was a fine character in her own right and served her purpose well. So, you can imagine how awesome it was to see her actually be playable in Sonic Runners. No one expected that, myself included! And, she’s gotten a little more Sonic Channel art. Now, I wouldn’t call this an upswing, but it at least shows that Sonic Team hasn’t forgotten about her. If Tikal can return like this, perhaps there’s hope for the other scrapped peeps in the cast.